The Lederhosen are believed to have originated in the Alpines of Germany. There is a popular belief that they were first worn by the Bavarians. However, the records state that they were worn in Austria as well as in Germany by the peasants. Being popular among the hardworking and not so profound community of laborers, the trousers worn were sturdy, low on maintenance and were apt for rigorous work. The trendy looking trousers soon caught the eyes of the rich and riders, hunters, and the scout boys. The Bavarian style became the talk of the town among entire France, the global Fashion leader as "a la bavaroise". The nobles and courtly societal of the Rococo genre, 18th century, took pride in admiring the simple life of the peasants. Thus, the Lederhosen soon became the apple of everyone’s eye. While the riders and the hunters preferred rather rich leather pants, the scout boys preferred the trousers that were comparatively short. The laborers had long and weary hours of work and traveled miles for work. They needed trousers that were a bit easy. Hence, in the southern region of Germany or as the region is famously known ‘Bavaria’, a unique fashion emerged. The leather trousers that had a flap as a front door and thus, the Lederhosen were born. The peasantries choose to wear trousers with front flaps, ‘Kniebundhosen’ as well as the shorter version, the Lederhosen as per seasonal requirements. Their Lederhosen were made of either the goat or the sheepskin and had a rugged look and feel. They preferred to color it black. The nobles took the Lederhosen and decorated it in their own style. Their Lederhosen were made up of the deerskins, a much more softer and comfortable leather. This leather was of very superior grade and extremely comfortable. They further decorated the simple Lederhosen with rich embroidery that marked symbols of their nobility. It also gave the nobles Lederhosen a bit of distinction from the commoner’s Lederhosen. 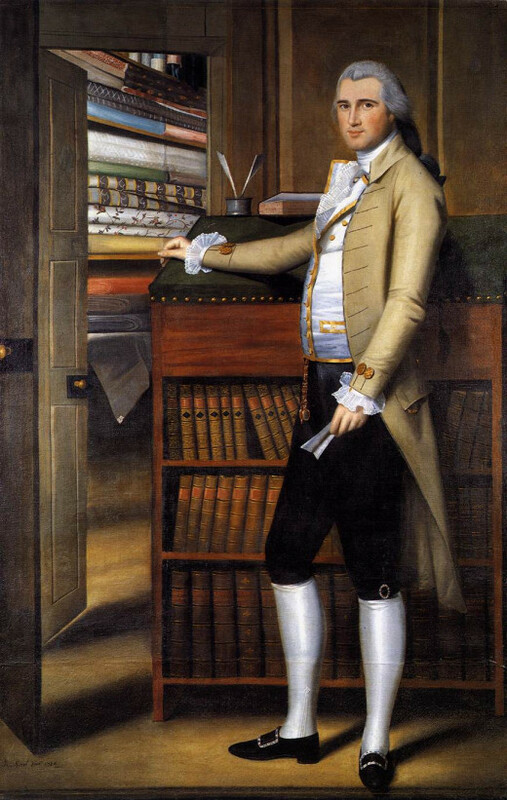 The unique embroidery was not only a part of the trousers and shorts, but also on the suspenders. With the passage of time, each region has its own kind of embroidery that signified where the Lederhosen came from. 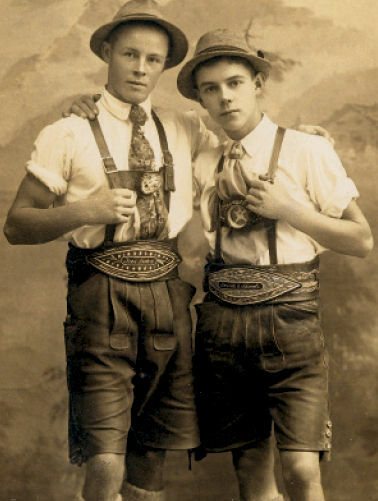 People preferred and took a lot of pride in wearing the Lederhosen that were marked with the symbols of pride from their own regional ‘Tracht’. It gave them a sense of belonging, a belonging that was rich in culture! The style was comfortable as well as popular. Now, people started keeping different pairs for different occasions. The pairs that were worn daily were comparatively simple and the ones used for the festive occasions were rich and distinct. Men even choose to wear the Lederhosen on their wedding day! All Good Things... Take a Break! The Second World War took a massive toil on Germany and Austria. The entire industrial base and economy was shaken to the core. Clothing got affected too and there was a massive shortage of supplies. No ready stocks of Lederhosen could be located. Furthermore, there was almost no availability of good quality of leather to make the Lederhosen with the same standards. While the supplies improved in mid-1948, the competition from the new age comfort fabric, jeans, had set in. The Lederhosen continued to be popular among the kids, teens and scout boys, but the big boys now preferred a pair of jeans. By 1980, the Lederhosen had become a traditional wear and the blue jeans have successfully taken its place. Lederhosen are now a part of the German cultural wear or traditional attire and are worn on the festive occasions such as Volksfeste, the Oktoberfest or "Kirchweih" as well as on the Biergarten. Again, people of all ages, irrespective of their nationality prefer to don the Lederhosen and give them the respect that they deserve. Well, if the blue jeans could take on the entire globe, Lederhosen had guts to take on the jeans. While traditionally the Lederhosen were made of leather, the modern take of the Lederhosen is available in jeans as well. 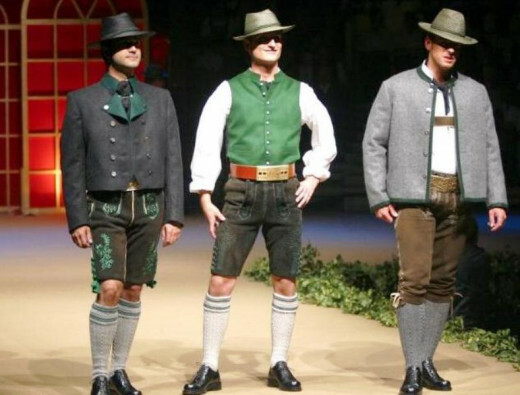 While originally they were colored black, the modern Lederhosen are khaki, gray, rust and even blue, red and green! The jeans Lederhosen are comparatively cheap and the ones made from leather are far more costly. The cost of a single pair of leather Lederhosen can be as high as $1000. While the price ranges anywhere between $80 to $1000, the cost is actually associated with the quality of the fabric as well as the intricate details of the embroidery. 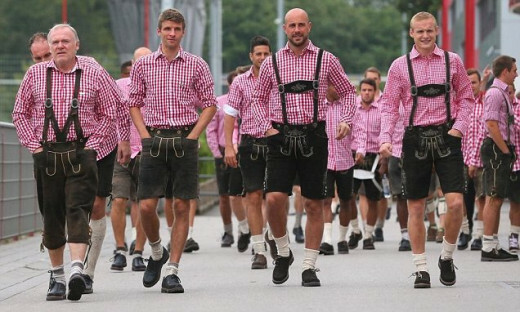 From sports to Hollywood, Lederhosen have caught the eye of all those who matter. 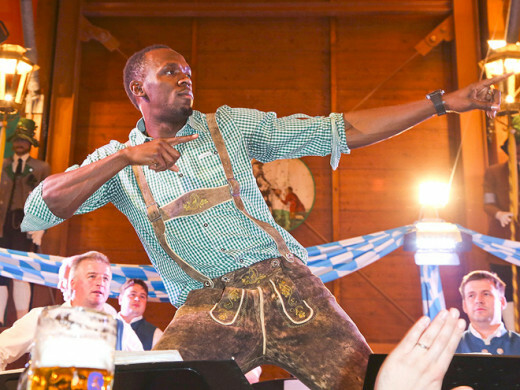 Usain Bolt and many other sports stars have been spotted at Oktoberfest in their element having fun. 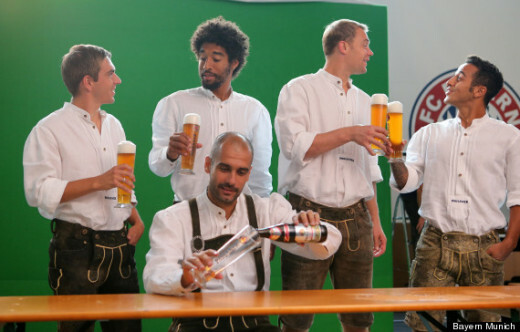 The entire team of the Bayern Munich players has been spotted in the Lederhosen in the annual trip to Oktoberfest. Fashion houses such as Karl Kluber and Speith & Wensky make some of the finest branded Lederhosen that are now available even in the US. 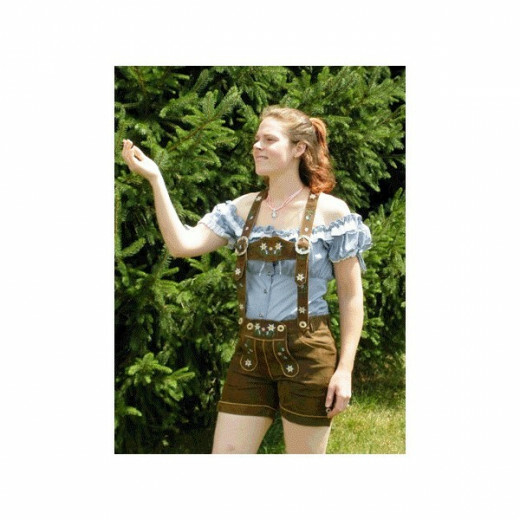 While traditionally, Lederhosen happen to be a menswear, yet it has gained popularity among female fans as well. The traditional wear for females, the ‘dirndl’ though, has been preferred Paris Hilton, Kim Kardashian and Teri Hatcher on their visit to the Oktoberfest. While Heidi-Klum disclosed that, she wore Lederhosen all her growing years. 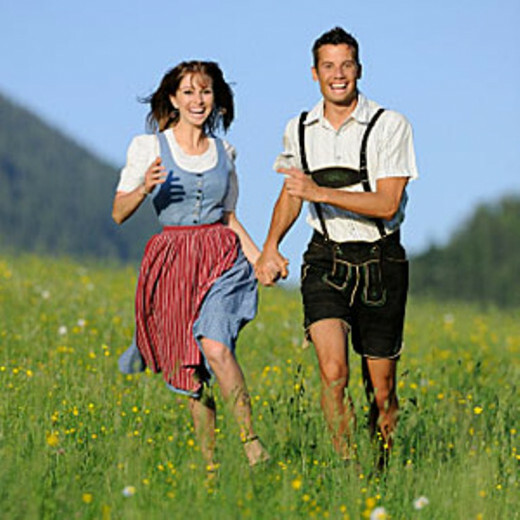 As Lederhosen are far more cozy as compared to a dirndl women prefer to wear Lederhosen to suit their personal style. While there is no difference in the practical look of men’s Lederhosen, girls usually prefer Lederhosen that are shot like the hot pants. By and large, the modern day and glamorous Lederhosen, while are not an everyday wear anymore, yet they most certainly have their impact in the minds of those love fashion and fun. Be it the beer festivities at Oktoberfest of the fun charity events in California, a prank teaser with the friends, or just to be cozy with self, Lederhosen continue to shine with their historical legacy. I am sincerely filled with gratitude. Well done, you are a wonderful writer. You have picked a unique subject. Love it! Thank you so much. Much appreciate your spirit and generosity. A wonderful article on a rare subject, very informative and original.